Our beautiful home, in our beautiful state: this place makes us who we are. If we start from the center and move outward: our campus is the place where we feel inspired, challenged, safe, and welcome. Intentionally small, and woven together by paths and pines, you can get from one side to the other in under ten minutes of walking. 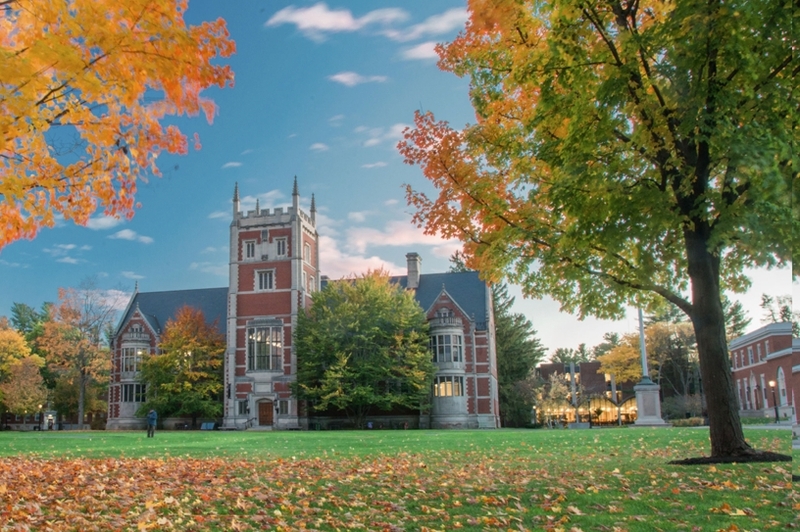 As Bowdoin has grown, we've worked to welcome our neighbors, respect our history and natural environment, and meet the needs of our students who will enroll twenty, forty, and one hundred years from today. We've reshaped our footprint multiple times in over 200 years. Our first building, Massachusetts Hall, originally held the entire college: students, faculty, and administration. Then for a short while, Bowdoin was home to the Medical School of Maine, giving rise to plenty of ghost stories. Step across Maine Street and you're in the heart of Brunswick—a bustling New England town, easily accessible by car, bus, or train. A summer tourist destination in its own right, Brunswick's vibrant, walkable downtown is active year-round, thanks in part to the needs of Bowdoin students, faculty, and staff. This is the home of hard work and deep seasons and sweeping views.